Annual Conference: Whose Is That Wall? 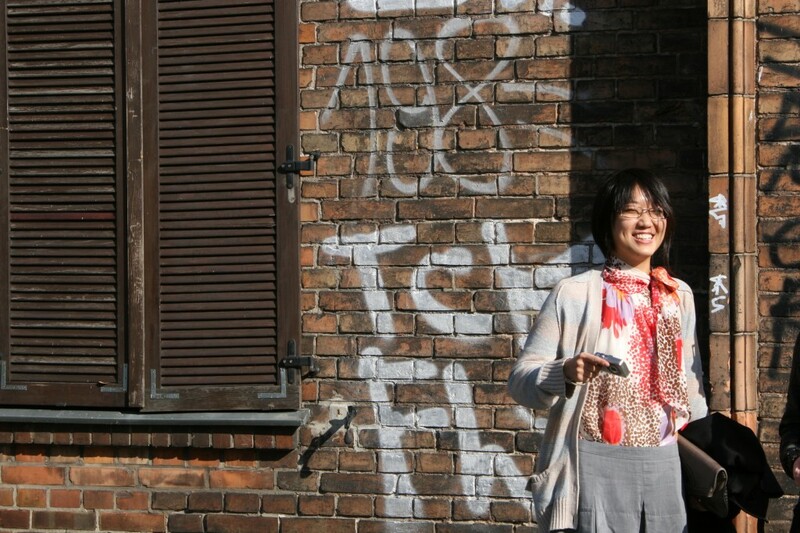 The very first event of the Annual Conference 2009 materialized with the support of ECLA art history faculty Aya Soika and addressed one of the many features of Berlin that I find particularly fascinating –the ubiquitous street art. I became a discoverer of street art when I saw that familiar cities ‘back home’ were no longer neutral, but had started to engage each pedestrian with their playfulness. Suddenly, forgotten corners of Bucharest, Brasov or Timisoara blossomed into gems of style and wit through which one ‘reads’ how a special group of dwellers lovingly approach their cities and poke at the indifference of others. No surprise that once I got the chance to live in Berlin, I felt like a child in a candy store. Walking (or biking) though the streets here comes close to reading a perpetually changing comic book. For this reason, I needed to transmit a dose of my exhilaration to those ECLA classmates with an eye prepared to see art in the most unexpected sites. My proposal for this years’ Annual Conference was a presentation of street art and the question of ownership, followed by a walk through Kreuzberg where we got more acquainted with the ‘works’ and, indirectly, with the artists. What we call ‘street art’ now is an umbrella term which originated in 1960s wall scribbling, and which expanded to include other manifestations that share a fundamental characteristic: using public space as display. Spray-painted names or words on building façades were a nuisance to everybody, initially; regarded as vandalism and punished by state authorities, this set the course for many of the practices still present in street art operations: the anonymity of the artists, the speed at which they work (prompted by the fear of being arrested), the formation of a ‘behind-the-scenes’ community, and the ephemeral and critical nature of this art. The scope is now international, no longer restricted to an urban setting, and by gaining the appreciation of city dwellers, it gradually grows out of its illegal relation with the city authorities. Nonetheless, this is a slow process undercut by massive arrests and rapid defacing of the works, even in cities where street art is old news by now. The controversy behind this practice offers various opportunities to ask the question: Who does a wall belong to? One could argue that since the artists remain anonymous and use public space as display, street art should be viewed as an act ‘of the people for the people’. Its critical discourse seems to point in the same direction, with works that either illustrate the problems of the neighbourhood community or carry a broader counter-cultural message. The first level of inquiry in my presentation was the legitimacy of using public space as display and an examination of the many functions of street art: as protest, to entertain, to represent, or to embellish the streets. I embrace the interpretation of street art as standing in opposition with consumer society; through its discourse, it exposes the pervasiveness of outdoor advertising that clogs up public space and laments the complacent attitudes of both citizens and authorities towards it. The growing popularity of the genre sends the works into art galleries (albeit of the ‘alternative’ variety) and generates international recognition for the artists. As a result of the latter, we now see strange paradoxes such as the auctioning of pieces of street art, or neighbourhood inhabitants raging about ‘their’ street art being vandalized (covered up or tainted by anti-graffiti groups). Insofar as artists (or groups) develop their recognizable styles and tags, street-art pieces are associated with them, and are thought to belong to them. At the same time, people who encounter them every day develop feelings of attachment and regard their disappearance as a theft from their common property. The artists one tends to associate with Berlin are already consecrated ‘travelling acts’ like BLU, Banksy, JR and Os Gemenos, whose works are large scale and have been legally produced under the tutelage of street art festivals financed from the city’s culture funds. Nonetheless, for me, street art maintains its flavour when it sneaks onto the wall illegally and unexpectedly overnight, like in the repetitive characters of ‘local’ artists Nomad, CupK, Alias, XOOOOX, or MYMO. Thinking about ownership in relation to street art makes one wonder whether the concept of ownership per se is not outside the scope of this genre.